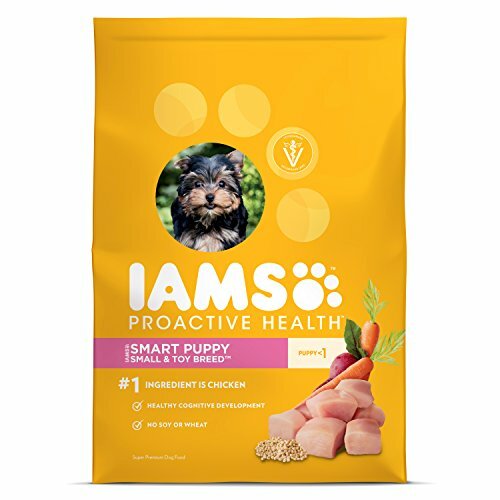 Is IAMS puppy food good? Hey, puppy mums and dads! Today we’re going to round up all the fun facts about IAMS for you in one place. No need to open loads of tabs or squint your eyes to read lots of tiny nutrition labels online, we’ve done that for you already. And we’ve loved every minute of it because there is just a heap of different options here for your larger puppy, your gluten-intolerant pooch, and even those dogs who need something a little softer and smoother on their tummies.The IAMS name (and IAMS paw print!) are probably familiar to most of you dog owners, as the brand can fairly often be found in vets offices worldwide. Though they’re a well-established brand internationally, IAMS manufacture in Nebraska, North Carolina, and Ohio. Good to know, right? Why the IAMS dog food reviews and IAMS puppy food reviews? Why are vegetables a good thing for my puppy? Should real meat be the first ingredient in my puppy’s food? IAMS have been incorporating the advice of nutritionists and experts into their dog food recipes since 1946, which makes them now over 70 years old. 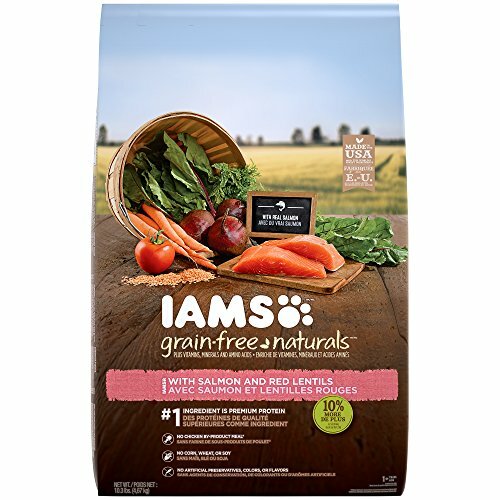 IAMS make a range of customized formulas for different canine life stages, as we’ve noted, as well as a vast array of breed-specific dog kibbles. 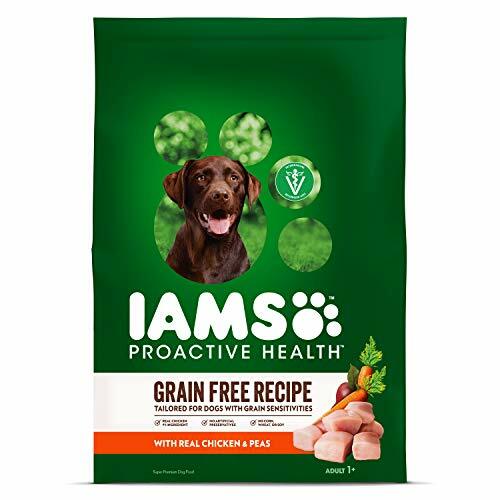 A particular point of pride for IAMS is that their dog food and puppy food uses a relatively high proportion of animal-based proteins compared to a lot of other brands. 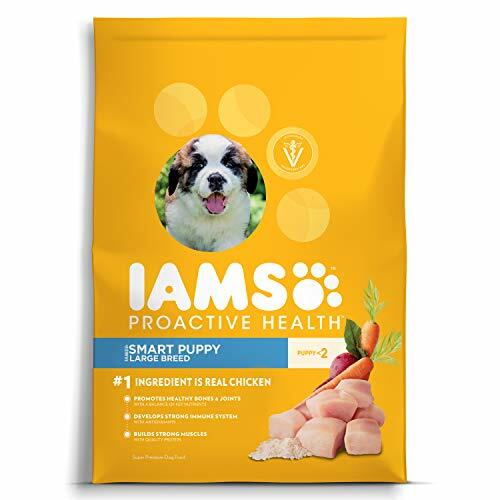 So, when you decide to choose IAMS for your pet’s dinner, they’ll be eating a lot of real and natural meats, which are complete proteins that contain every amino acid our pup’s bodies require. IAMS headquarters are in Ohio, and they’re part of worldwide pet food market-leading Mars Inc. Just like some of the other brands we’ve had a look at together. 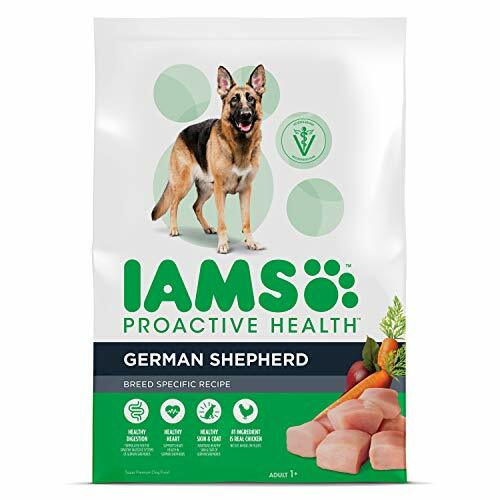 IAMS make a LOT of different formulas, and among these, you’ll be able to find weight-management recipes containing L-Carnitine for fat burning, grain-free blends for gluten-free pooches, and tailored formulas for different breeds. Their large dog kibbles are made with nutrients like glucosamine to help bigger dogs to prevent common big dog problems such as cartilage degradation or arthritis. In contrast, their smaller pooch blends contain a higher number of calories in every scoop, which is perfect for their rapid puppy growth period. We also think it’s awesome that all of IAMS puppy foods are made with DHA, the element that all baby pups get from their mother’s milk. DHA is particularly important for healthy neural and cerebral development, and IAMS believe that this makes your puppy much easier to train. They make products for those of us who have puppies and dogs with special requirements, including tummy and skin sensitivities. We always try to put together as broad a selection as possible for you, so we’ve gone ahead and done our research to bring you six different kinds of IAMS dog food review. IAMS Naturals came along in the 90’s at the same time as the company published its research on how Omega acids play a role in shiny, beautiful canine coats. So, this salmon-based adult kibble is rich in these nutrients, which is always a huge plus! There are spinach, tomatoes, carrots, peas, apples, blueberries, and more in here, for phytonutrients, beta-carotene, and antioxidants! Zero synthetic preserving ingredients, and no artificial coloring or flavorings either. None, we like this Naturals adult range a whole bunch! Well, there’s quite a mini-rainbow of veggies, legumes, and fruits in this protein-rich recipe! We just adore it- our dogs love salmon, and we reckon your best friend will, too. Five stars out of five! All puppy sizes will get a complete meal from this Proactive health formula. Chicken’s heading our ingredients list, and there are a whole lovely bunch of fruits and vegetables in here, too! Blueberries, peas, carrots, spinach, and apples are to be found in here, giving your little puppy a healthy dose of antioxidants, yay! 2% calcium, a great amount for solid and strong bones- and perfectly balanced with phosphorus, too. While there is no soy, nor wheat, in this puppy blend, it does contain some corn. So it’s not 100% grain-free. Our IAMS puppy food rating is 4 out of 5 stars for this real chicken-based, protein-rich puppy kibble. 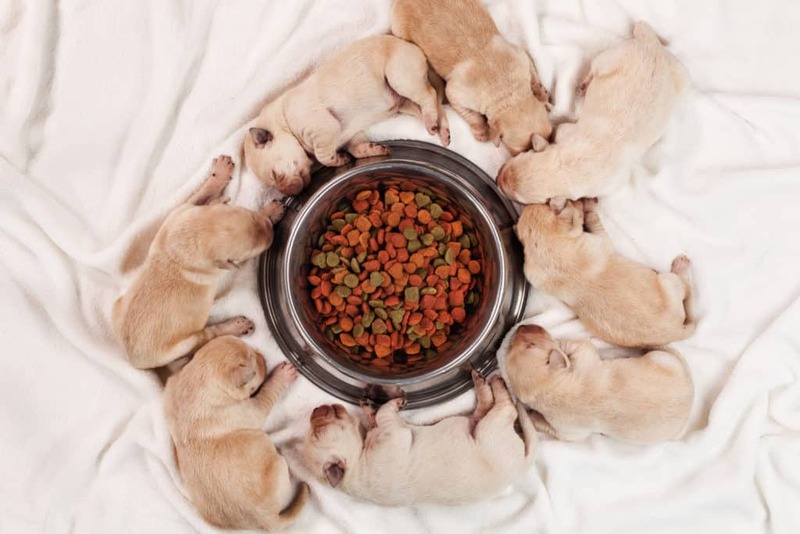 Multiple protein sources help to contribute to a rotational diet and also prevent the potential allergies that can result when pups are overexposed to one ingredient over time. The chicken in this large puppy food is farm-raised, and we like this a lot. Chicken’s our top ingredient here, too, so we’re off to a great start. Let’s take a closer look, shall we? Once again, Vitamin E will play a key role in helping your lovely puppy grow an equally lovely coat. Made with some corn, meaning puppies who can’t handle gluten won’t be able to tolerate this kibble. 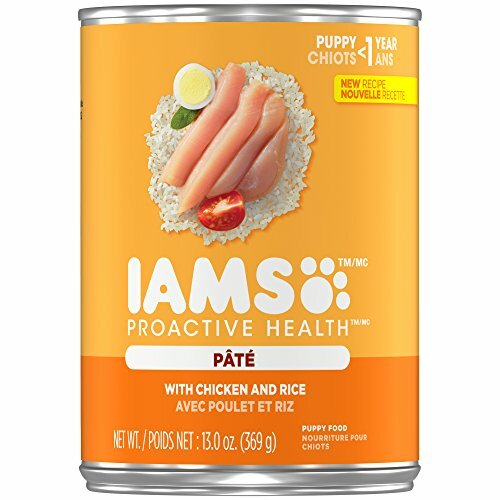 Because this IAMS recipe is for bigger breeds such as our awesome Rottweilers, Huskies, and Labs, it’s A-OK to feed to your puppy until he is 2 years old. We’re giving this one four out of five stars for its great nutrient profile. Yum, pâté! Softly-digestible rice and chicken make a home-cooked-style dinner for your little (or larger) puppy of up to 12 months. Omega acids 6 and 3, in conjunction with Vitamin E supplements, make this a fabulous choice for shiny puppy coats so that they’ll look and feel…well, fabulous! There’s yam in here, for thiamin, manganese, and potassium. We don’t see yam a lot in puppy foods or dog foods, so this is quite a nice, healthy treat! There are by-products of chicken and an ambiguous ‘meat’ in this recipe. There are a fair few excellent ingredients here, and the nutrition profile looks just great. While we prefer to see real meat in our puppy’s dinner rather than by-products, the latter is undeniably extremely rich in proteins. Glucosamine’s super-critical for larger dogs, as it plays a pivotal role in helping them to avoid arthritis and conditions such as hip dysplasia. Alongside multiple protein sources, this blend’s an awesome choice for bigger grown-up dogs, including but not limited to German Shepherds, Labradors, and Great Danes. Chicken’s right atop our ingredients list, yum! There’s at least 22.5% protein in this recipe, to satisfy your large dog’s lean muscle maintenance requirements. Made with corn, so not suitable for adult dogs who aren’t able to tolerate gluten. Another way that this dinner’s been specifically formulated for bigger puppies and dogs is through the addition of L-Carnitine, which assists fat metabolism and works to keep heart disorders at bay. 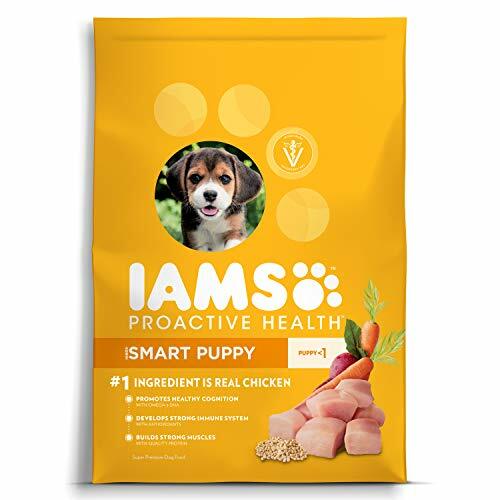 Chicken and egg are the key protein providers within this IAMS recipe for tiny and small puppies. There are a whole lot of calories per cup, which means this formula is able to give your little pooch enough energy for his relatively concentrated growth period. A whopping 1.2% calcium will keep your little puppy’s bones strong. Contains corn, so it’s not entirely grain free. Here’s a fun, fluffy fact for you, friends- the world’s smallest recorded living dog is a 3.8 inch tall Chihuahua. This blend would probably have been just right for her when she was a pup, given that it’s vet- and AAFCO-approved for the growth of tiny pooches. Real, high-quality ingredients have gone into this appetizing kibble for grown dogs big and small. Chicken and garden peas make up this mouth-watering blend, which contains zero grains whatsoever. Protein’s at a minimum 24%; fat’s at a healthy average of 13%. Not suitable for our pooches who have chicken sensitivities. Other than this, it’s just fantastic in our book. We absolutely love it! It’s so rich in antioxidants, vitamins from apples and blueberries, and minerals like copper, iron and also zinc. Plus, it’s great for grown-up dogs who aren’t able to eat any grains, and it’s just replete with lean proteins. What’s not to love? Five out of five stars! Contrary to very popular belief, our fluffy canine friends are actually omnivores, not carnivores! This means that, like us, and unlike their feline counterparts, puppies and dogs will get vitamins, minerals, fiber, and antioxidants from fruits as well as vegetables. Vegetables can be a fantastic source of Vitamin E, which is great for healthy, silky coats, and B vitamins for energy. Spinach, blueberries, and other superfoods which provide antioxidants help your puppy to fight cancer by combatting cell damage, too, while the natural fiber helps your puppy digest more easily. That’s why they form a healthy part of any good puppy food, like the ProActive kibble in our Hypoallergenic IAMS Dog Food Review. It’s not a bad idea to look for a puppy food or dog food that is able to list a real meat as the primary ingredient. Puppy foods that boast something like boneless chicken, real lamb, or even a milled real meat (not a milled by-product, though) are giving your puppy a healthy dose of protein from an identifiable source. And because our pups need relatively hefty amounts of protein for their development, it’s recommended that you be able to understand where it’s coming from. One exception to this rule is when your vet has advised you to feed your puppy on something like hydrolyzed soy protein due to his intolerances. When you’re looking at fats in the ingredient list of your puppy’s food, too, it’s always a good thing to be able to understand where the fat is coming from. So, something like ‘beef fat’ is always going to be a plus compared to something obscure such as ‘animal lard’.